Days after being slammed by president Donald Trump for its domestic capital spending plans, General Motors has given in to the criticism and announced that it’ll make a $300 million investment in its electric car plant in Orion, north of Detroit, according to Bloomberg. The bailed out automaker which stopped reporting monthly sales roughly the same time the US auto sector peaked, said that the company is making “major new investment[s] focused on the development of GM future technologies” at the facility that builds its fully electric Chevy Bolt cars. The news is expected to be officially announced with the United Auto Workers and the expectation is that the investment will come in the form of a new electric car. The new investment is expected to add hundreds of jobs and a new electric vehicle would show GM’s shift from gas cars to electric in action. 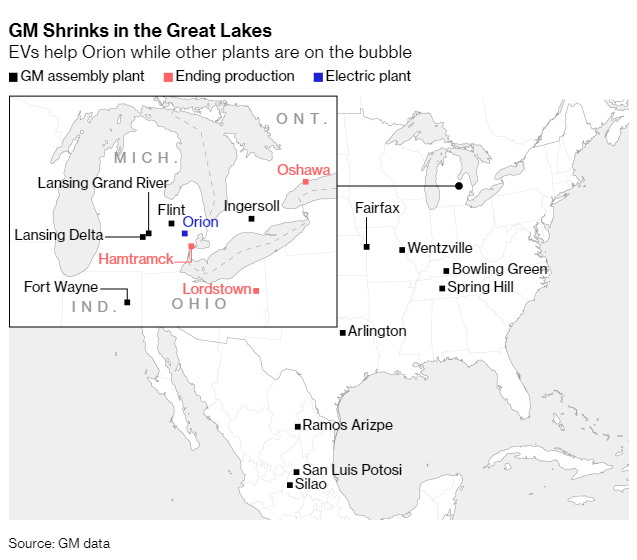 The question of whether or not the company’s plans for its Orion factory are enough to appease Trump remains to be seen. Trump is looking to keep Ohio voters on his side for the 2020 election, and the coming investment is supposed to offset idled or closed plants near Detroit. General Motors also drew the ire of Trump after they announced that they had no future product allocated to five North American plants and cut about 14,000 jobs. Some of these workers had to relocate to plants in Michigan, Tennessee or Texas and others were simply dismissed. GM has relocated about 1000 of the 2800 affected US hourly workers to other plants. In anticipation of Trump’s visit to Ohio, GM sought to defend itself, stating that the automaker has invested about $21 billion in the US since emerging from bankruptcy in 2010. But at the same time, GM has ramped up its operations in Mexico. Last year the company imported almost 1,000,000 vehicles into the US from NAFTA countries, with most coming from Mexico. GM’s Orion plant builds the Chevy Sonic subcompact and has tooling in place to handle battery packs. As of now, the factory operates at only about 40% of its production capacity, meaning that the addition of a new electric vehicle could help better utilize its assembly lines. Next articleWith RussiaGate Over Where’s Hillary? Just remember when odumbie gave them the money. They used it to build in Mexico and China. Trumps’ wrath, yeah just like McCain is suffering deferment donnies’ wrath now … hope it works better on the living then … welcome to deferment donnie & kentuck turtle-faces’ U$A ?!? This story has nothing at all to do with Trump. Yet this author thought he could throw false partisanship into the story. The author already has Carl Bujan fooled.